Well hey, sweet sister! I know your life is probably getting more hectic like the minute with Christmas fast approaching and your to-do list probably feels like it never ends - but I want you to remember one very important thing about this time of year. All that busy-ness, all that preparation, all of the celebration is because Jesus was born. Jesus, our King and the Lord of Lords was born in a manger as a tiny, precious human baby. Our God was born here on earth, in human flesh as a tiny fragile newborn. Our Lord that came to die for our sins so that we could be forgiven - so that we could be pure and blameless in God's sight. 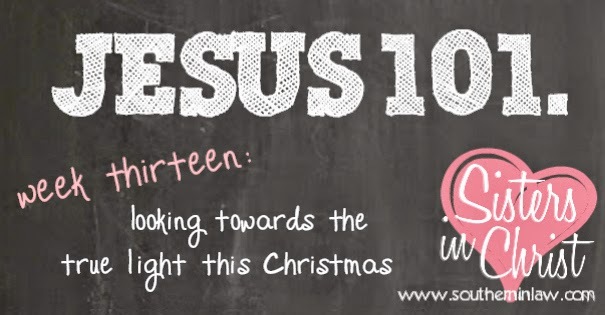 Jesus gave us the most incredible gift - so let's take a little time out to spend with Him. As we get closer to Christmas, lights are strung up on houses, twinkly fairy lights adorn Christmas trees in living rooms and many find themselves lighting candles for an extra festive touch as friends and family join them to celebrate the festive season. Can you imagine what Christmas would be like without light? Light and Christmas are a seemingly perfect combination - have you ever thought why that is? Why we choose to adorn our houses and our trees with twinkly lights during this time of the year - but not any other? Light is a pretty powerful part of Christmas. The true reality of Christmas is that it's all about the light of Jesus. The hope and love brought from God, brilliantly revealed in the birth of a tiny newborn in a manger in Bethlehem. The light of God's undeserved love shines bright throughout the Christmas season - but somehow we often overlook it in favour of things. What's on the Christmas table, what's under the tree, how many parties we need to attend and when on earth we'll have enough time to write Christmas cards. But what we need to focus on is the true light. Jesus was born as a fragile newborn because He came to meet us. He came to die for us. He came to save us. The everlasting light that is Jesus Christ fills us with His light, His love and His life and He refreshes and renews us each and every day. Christmas is special not just because it's wrapped up in tradition and ritual and nostalgia - but because the light of the world came to us with His forgiving love to set our hearts on fire so that we could follow Him. The light of Jesus shines in our hearts and we don't have to remain in the dark - because even the tiniest, smallest, speck of light will shine through the darkness. It's only when we turn the light on in a dark house that we can safely see to navigate through it. Sure, we could get through in the dark - but we'd probably stumble. You think you know what's there but in reality, you're only guessing. The light clears away any problems that might pop up on our path as we head to where we want to go. But Jesus isn't telling us we should live with the lights on - Jesus is speaking about spiritual darkness. Spiritual darkness represents the absence of the light of God - or a separation from that light. Spiritual darkness represents sin and the sinful nature that we all have in us - and it's that sin that separates us from God. Jesus came as the answer for that spiritual darkness. He came as the solution. He came to mend our broken relationship with God. What Jesus is telling us in that passage above is that He came to bring us light. He came to tell us that He has the solution to the problem that no one else can fix. We can't restore our relationship with God through good works or favours - Jesus restored our relationship with God through His death on the cross. It's through our trust and faith in Jesus that our relationship with God can be restored. It's through Jesus that we step into the light. Without Jesus we are walking in a spiritual darkness which we will never be able to escape on our own. We're lost in the darkness of sin, hopeless and helpless - but as He says, Jesus came to bring us light so that we need not remain in the dark. A lot of people who don't know Jesus think of Him as this huge guy sitting up there in heaven, looking down on the earth with a list in hand checking who's naughty and nice - but Jesus isn't Santa. The world thinks that Jesus requires perfection - that if we're not perfect, we're surely going to hell. But I want to tell you something: No one can be perfect. It doesn't matter how hard you try, you'll never achieve it. We're sinful by nature - but luckily Jesus was perfect and He lived the perfect life so that we didn't have to! Jesus came to be our saviour - and each time you take a look at Christmas lights this holiday season, I want you to remember the promise of the true light - Jesus Christ. I want you to remember the gift that He brings you. Jesus isn't sitting there judging you, He wants to show His love for you by redeeming you, forgiving you and saving you so that you may never have to walk in the darkness. All you have to do is accept Him into your life. Yess amen to these beautiful words filled with truth, my love! It's funny to think that Christ was fully GOD in diapers back when he was a wee human, hah! I can't quite grasp how He would want to identify WITH us in order to fully make His death and resurrection that much more valid. This way none of us has an excuse of "you don't understand, God" because if there's anyone who knows--it's Him. I love how you said this: " Sure, we could get through in the dark - but we'd probably stumble. You think you know what's there but in reality, you're only guessing". Most of us think we can be fine on our own, but really, wouldn't life be so much better not having to go through unnecessary grief? I also always alwayyyys think it's wise to telll people that although the Christian walk isn't easy like many make it out to be, nor do we stop facing trials because if anything, we face more than what is normal sometimes, we HAVE HIM TO WALK US EVERY STEP OF THE WAY. Doesn't matter if hurricanes or sunshine come. He's with us and will reveal amazing things throughout our journey and ultimately, at the very end when we meet Him face to face. <333 Yup! Amen, haha. It totally blows my mind to think that OUR God had to learn to walk and talk the way that we did! Oh and I am so with you - Christian life isn't the easy road, but we walk with the King every step of the way! Even when we fall, He is there to pick us up and dust us off. I was once watching something where they used an image of a child walking hand in hand with their father to cross the road as an illustration of how we walk with God and it has stuck in my mind ever since. Just like our parents protect us from harm (yet do let us take risks because they know it's necessary for us to grow!) and pick us up whenever we fall and do their best to heal our pain, so does God.